This morning (Tuesday 8th April 2014) IWPS house team met with the Mayor of Bruqin, Nafiz Brakan, and local activist M. at the Bruqin Baladiya. The majority of our meeting focused on the problem of sewage and chemicals from the illegal Ariel settlement and Barqan industrial area that are being leaked into Bruqin and neighbouring Kufr-ad-Dik. 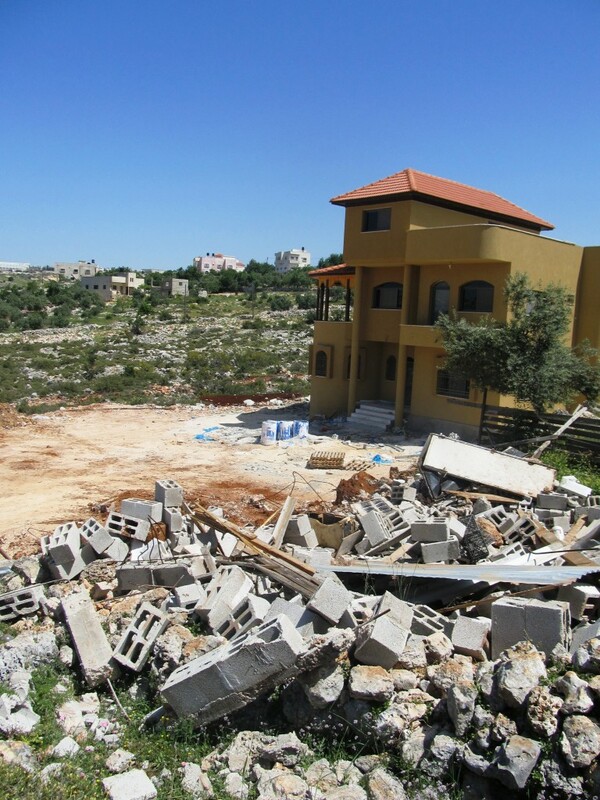 The other problems that the village is facing include the expansion of the illegal settler colony of Bruchin, the destruction of olive trees, settlers releasing dangerous animals into the community, fines imposed on farmers for harvesting vegetables on their own land, housing demolition, and incursions of the Israeli military into the village. Pollution has been an ongoing problem in Bruqin for several years. There are over 200 hundred factories operating in the illegal Barqan Industrial Area, located approximately 4km from Bruqin. These factories produce petroleum products, plastics, glass, and cosmetics, among others; chemicals from the factories are piped into the valleys that flow into Bruqin. Many Israeli-owned companies choose to operate in illegal settler colonies in the West Bank because there are fewer regulations, and less enforcement, than there are on the opposite side of the Green Line. As of 2012, IWPS reported that there had been no independent reports on the water quality in Bruqin, while Israeli companies kept on insisting that the water is uncontaminated. The mayor has not succeeded in finding an independent test, but it is believed that the chemical waste contains a high level of carcinogens. The second source of pollution comes from the illegal settler colony of Ariel. Sewage from Ariel is pumped out near the Al-Matwi spring, which flows downhill into Bruqin and Kufr-ad-Dik. 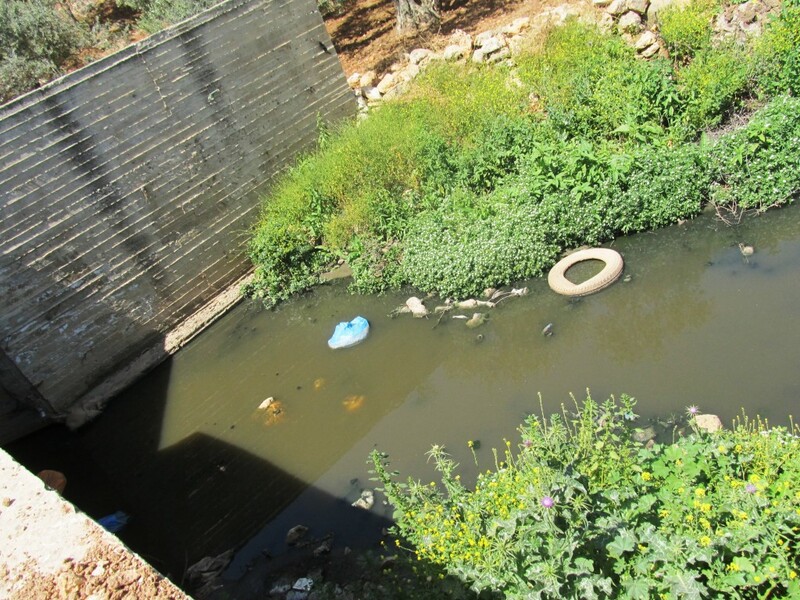 The Palestinian Authority, in collaboration with the German Government, had proposed to build a sewage treatment plant at Al-Matwi, to prevent sewage from flowing into Bruqin. The proposal was denied by the Israeli government because they claim that Al-Matwi is owned by the settlers (it is not). Because the proposal was denied, the German government has withdrawn funding. The villagers in Bruqin are facing many problems because of this pollution. Most notably, there has been an increase in cancer cases, especially among children. The villagers also cannot use water from the stream that runs through town, or any of their wells. Animals are dying from thirst, or from poisonous water, which also poison the meat and milk that villagers would use for food and income. Bruqin is in the process of building a 2km pipeline that would divert the polluted water underground, as there is currently exposed sewage flowing aboveground. The cost of this pipeline is 1.8 million Israeli shekels (more than US $500,000), and is funded by the Palestinian Authority. The Mayor hopes to extend the pipeline from al-Matwi to the far side of Kufr-ad-Dik, but there are no funds available at this time. The illegal settlement of Bruchin, located 1/2km from Bruqin, has recently stolen 700 dunams of the Palestinian village’s land. The settlement has announced that it will begin construction this year on 500 new settler houses. These, as well as others, are all illegal under international law. Several villages in the area have reported attacks from wild pigs and cobras that are not native to Palestine. Villagers have seen settlers releasing pigs near Palestinian villages, with the intent to cause harm, as the animals are dangerous, as well as to cause shame, since pigs are haram [shameful, religiously unclean]. Palestinians who have killed these pigs have been arrested. The mayor also told us that farmers have been fined up to 7,000 shekels [US $3,000] for picking akoub and sage plants on their own land. Israeli soldiers often enter Bruqin in small groups at night. Because the soldiers use side roads, or approach young children unexpectedly, the Mayor believes they are trying to provoke attacks and unrest. The villagers have remained peaceful and do not seek out confrontations with the soldiers. After the meeting, we were taken to see the pipeline construction, as well as the polluted stream. The stream stank of sewage. The team was also taken to see an agricultural building near the village that was demolished on 1 April, on land that is considered Area C according to the Oslo Accords. The building was a 6×6 meter shed that had been used to house rabbits. It was built in 2006, and cost the owner approximately 6,000 shekels [US $2,700] to build. Demolition orders were delivered 5 months ago. It took nine military jeeps and 1 bulldozer at 4.30am to demolish the shed. Rabbits that were kept inside were either crushed by the bulldozer or escaped to neighbouring hills.